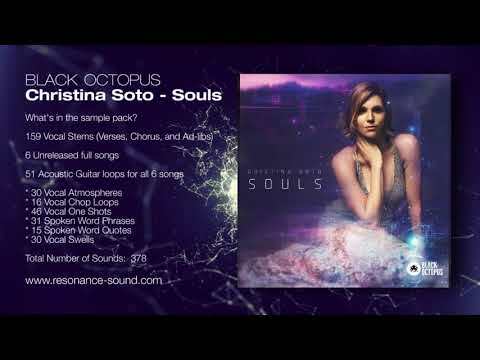 Superstar dance music vocalist Cristina Soto is here to present ‘Souls,’ an incredible collection of royalty free vocals. Having worked artists like Tritonal, Illenium & Said the Sky, Au5, Bassnectar, Psymbionic, Matt Lange, and many others; Cristina brings her Triple-A game expertise to your studio. Tags: Deep House, EDM, Future Bass, Vocals. There are twelve folders of highly usable vocal content including six full songs. These are all packed with vocal layers, harmonies, doubles, verses, chorus’, and even multiple acoustic guitar stems! Spanning the spectrum from 120-182BPM, this pack is the perfect addition to your productions, regardless of style! Each of the full length songs are recorded in different keys for optimum versatility. Each of these is bound to spark an idea or lift an already existing track to the next level. There are also six incredible vocal effects folders, with Atmospheres, Vocal Chops (both loops & one shots), spoken word, and vocal swells.